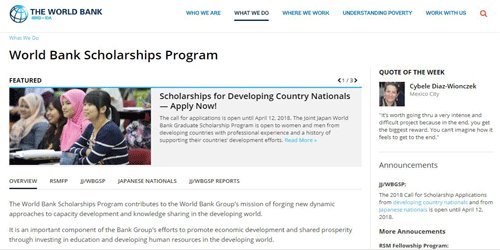 Applications are invited for Joint Japan/World Bank Graduate Scholarships Program (JJ/WBGSP) from the nationals of developing countries. Scholarships are awarded for studying only at a master program that has been granted “preferred” status by the JJ/WBG Scholarship Program. Applicant Should Be under 45 years old on the application deadline date, and have at least 3 years of recent development-related experience since earning a Bachelor’s degree. Note: The JJ/WBGSP scholarship may only supplement, and does not duplicate, any other source of financial support, fellowship you might have. If selected as a finalist or if you are awarded a scholarship, you must inform the JJ/WBGSP if you have other sources of scholarship funds. The JJ/WBGSP stipend may be withdrawn completely or partially if during the scholarship period the Program has evidence of additional sources of support. Africa and Japan in key areas of development, including economic policy management, tax policy, and infrastructure management. Scholarship can be taken in Scholarships are available for preferred university masters programs that are listed on the JJ/WBGSP website, and that is located outside of the applicant’s country of citizenship and country of residence. Eligible Countries: Students of developing countries can apply for this scholarship. Be employed in development-related work in a paid full- time position at the time of submitting the scholarship application. Application Guidelines for each call for scholarships. *Please note: All eligibility criteria are strictly adhered to. No exceptions are made. Eligibility criteria WILL NOT change during an open call for applications. However, this information is subject to change between the close of one application process and the opening of the next. ATTENTION: The call for applications for a JJWBGSP Scholarship to one of our Preferred Programs is now open from February 22 to April 12, 2018. FAQs and the complete list of JJ/WBGSP Preferred (.xlsx 49 KB) Master Degrees currently offered. Please read these documents before starting your application. refer to the “Accessing your online application” and “Navigating your online application” to navigate step-by-step the online application. Those seeking a JJ/WBGSP Partner Program scholarship (.xlsx 15 KB) must first apply for admission to one or more of the Partner Masters Degree Program(s). 0 responses on "World Bank Fully Funded Graduate Scholarship Program 2018"